Oncologist Donald Abrams confronts cancer with both conventional and integrative methods. During the past 25 years, as mounting research has demonstrated the efficacy of treating patients with means that go beyond a standard physician’s prescription, “integrative medicine” departments have appeared in 56 U.S. academic medical centers and dozens of hospitals. Donald Abrams, who straddles conventional oncology (as chief of oncology at San Francisco General Hospital) and integrative methods (as a practitioner at the Osher Center for Integrative Medicine at the University of California, San Francisco), explains the value of the combination. 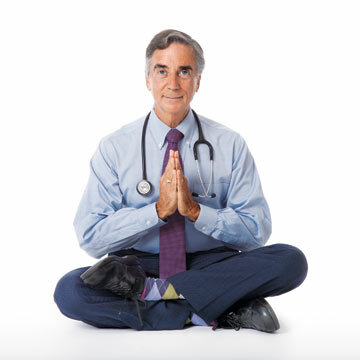 Q: What is integrative medicine, and how is that different from alternative medicine? A: When we talk about integrative oncology a lot of people think of CAM, the shortened acronym for the government’s National Center for Complementary and Alternative Medicine. But the alternative medicine part of that is something we’d like to do away with. It’s contradictory. Something can’t be complementary—“in addition to”—and alternative—meaning “instead of”—at the same time. Q: Where does a typical oncologist’s job leave off and an integrative practitioner’s begin? A: At the Osher Center, I see patients whose cancer is being treated by somebody else. I spend an hour with new patients, trying to understand how a patient’s diagnosis and treatment plan affect his or her life and family. I tell the patient that cancer is like a weed. The oncologist is taking care of your weed—providing chemotherapy, surgery, radiation—whereas it’s my job to work with the garden and make your soil as inhospitable as possible to the growth and spread of the weed. Then I say: Let’s look at how you’re fertilizing your soil; that is, what do you eat and what supplements are you taking? I discuss lifestyle issues, including weight reduction and methods to reduce stress, whether it’s massage, tai chi, yoga or mindfulness. Finally I ask patients: What brings you joy, what are your hopes and where does your strength come from? I show them they still have those three things and engage their spiritual side to work in the voyage ahead to combat this disease. Q: You note that integrative medicine incorporates “evidence-informed complementary therapies” with conventional care. What’s the difference between evidence-informed and evidence-based? A: “Evidence-informed” is a more realistic appraisal of the evidence we often work with; we don’t always have randomized placebo-controlled, double-blind trials to provide us with the degree of certainty we want. In oncology you’re often dealing with people who don’t have time to wait. Cancer patients are seeking ways to improve their prognosis and maintain disease-free survival, and to counteract side effects. The most successful diagnoses treated with integrative medicine include chronic pain, anxiety, stress and depression. For me, the most significant intervention is nutritional. A: Patients ask their oncologists what to eat, and oncologists often respond that it doesn’t matter—or eat what you want. Worse, some radiation oncologists may say, eat only “white foods,” which are low in antioxidants, out of concern that antioxidants will interfere with treatment. I believe that concern is unfounded. I endorse the broad guideline to eat an organic, plant-based, antioxidant-rich, anti-inflammatory whole foods diet, even during treatment. I also follow very closely the World Cancer Research Fund/American Institute for Cancer Research guidelines, which encourage avoiding sugar and red meat, and eating more fruits, vegetables and whole grains. Q: Can we say that integrative medicine includes medical marijuana? A: Certainly, in my practice it does. In California, where medical marijuana has been legal since 1996, a day doesn’t go by when I don’t recommend it. Cannabis is the only antiemetic that also increases appetite. In research I’ve demonstrated that cannabis is useful for HIV-related nerve damage. I’ve also conducted research demonstrating that patients adding cannabis to opioids experience increased pain relief. Cannabis also helps people sleep, and it’s a mood elevator for some. A patient would get five different prescriptions from his oncologist for those problems. And it’s a medicine patients can grow. When I ask patients what brings them joy, the number who say that gardening brings them joy is not insignificant. I think that’s understandable—if you feel that a part of you is dead or that you are dying, the ability to bring life out of the ground is a mitzvah. Through his work with genetic mutations, Daniel Haber has discovered that cancer is sometimes more vulnerable than once imagined. Lucian Leape, the father of the modern patient safety movement, talks about the culture of disrespect in medicine—and how to fix it.